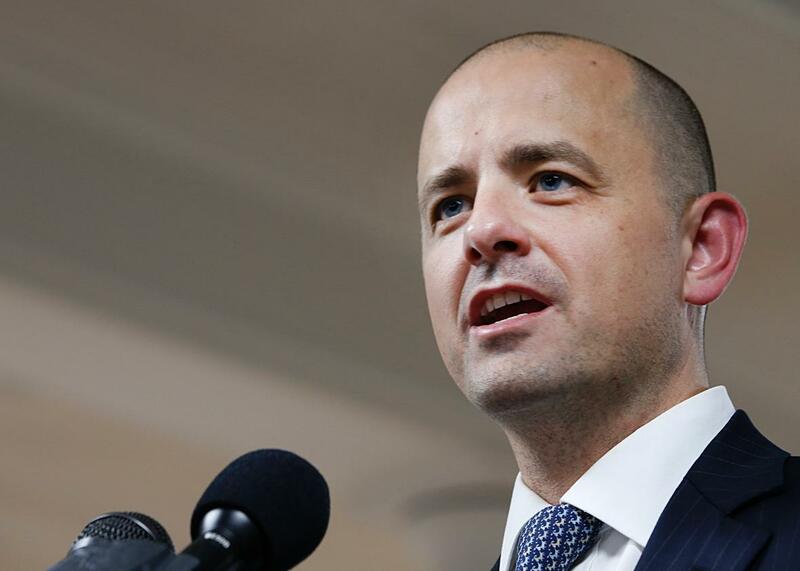 Evan McMullin announces his presidential campaign as an independent candidate on Aug. 10 in Salt Lake City. On Monday, a prominent white nationalist supporter of Donald Trump’s emailed members of the media with audio of a robocall trashing Evan McMullin, the independent presidential candidate who’s polling closely with Trump in Utah. “The attached robocall will go out to Utah voters starting this evening,” William Johnson, a California lawyer who’s active in white nationalist circles, wrote. “I will start with rural Utah today and expand to urban areas tomorrow.” He claims that the call is paid for by his independent expenditure group, American National Super PAC—a group that, according to its quarterly filing submitted last week, has a total of $7,165 on hand. I asked Johnson for details on the cost and reach of the robocall. He sent a screenshot of some receipt showing the call scheduled to reach 193,623 residential landlines in Utah between Monday and Wednesday nights. “The cost to send out these robocalls is about $2000,” he told Slate in an email. Here is the text of the robocall he passed along. Hello, My name is William Johnson. I am a farmer and a white nationalist. I make this call against Evan McMullin and in support of Donald Trump. Evan McMullin is an open borders, amnesty supporter. Evan has two mommies. His mother is a lesbian, married to another woman. Evan is okay with that. Indeed, Evan supports the Supreme Court ruling legalizing gay marriage. Don’t vote for Evan McMullin, vote for Donald Trump. He will respect all women and be a president we can all be proud of. Johnson ran to be a delegate for Trump in the California primary and was included on the original slate of delegates the Trump campaign submitted. After Mother Jones broke that story, the Trump campaign attributed his inclusion to a “database error” and Johnson stepped down.